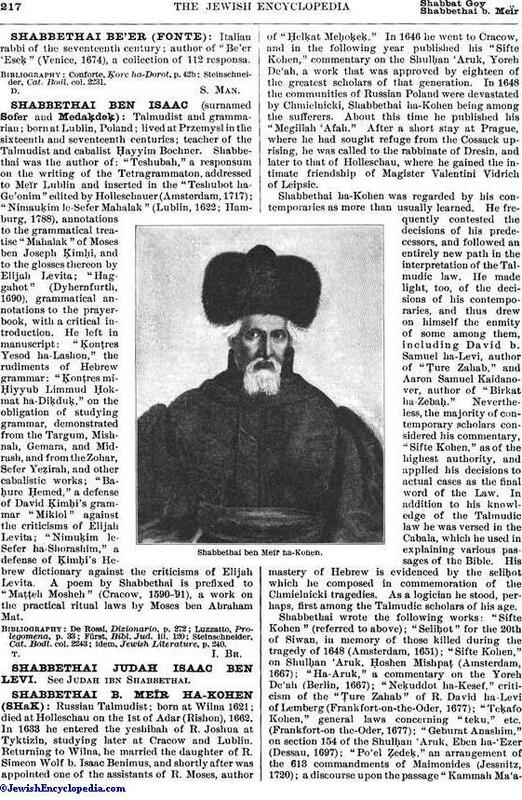 Russian Talmudist; born at Wilna 1621; died at Holleschau on the 1st of Adar (Rishon), 1662. 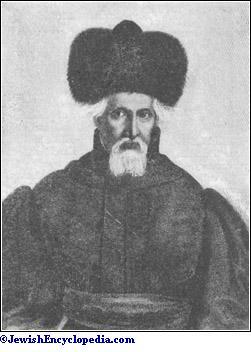 In 1633 he entered the yeshibah of R. Joshua at Tyktizin, studying later at Cracow and Lublin. Returning to Wilna, he married the daughter of R. Simeon Wolf b. Isaac Benimus, and shortly after was appointed one of the assistants of R. Moses, author of "Ḥelḳat Meḥoḳeḳ." In 1646 he went to Cracow, and in the following year published his "Sifte Kohen," commentary on the Shulḥan 'Aruk, Yoreh De'ah, a work that was approved by eighteen of the greatest scholars of that generation. In 1648 the communities of Russian Poland were devastated by Chmielnicki, Shabbethai ha-Kohen being among the sufferers. About this time he published his "Megillah 'Afah." After a short stay at Prague, where he had sought refuge from the Cossack uprising, he was called to the rabbinate of Dresin, and later to that of Holleschau, where he gained the intimate friendship of Magister Valentini Vidrich of Leipsic. Shabbethai ha-Kohen was regarded by his contemporaries as more than usually learned. He frequently contested the decisions of his predecessors, and followed an entirely new path in the interpretation of the Talmudic law. 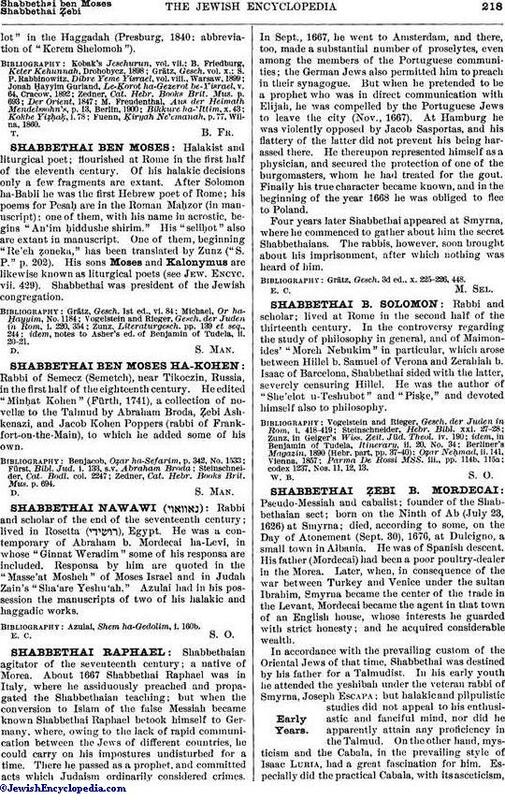 He made light, too, of the decisions of his contemporaries, and thus drew on himself the enmity of some among them, including David b. Samuel ha-Levi, author of "Ṭure Zahab," and Aaron Samuel Kaidanover, author of "Birkat ha-Zebaḥ." Nevertheless, the majority of contemporary scholars considered his commentary, "Sifte Kohen," as of the highest authority, and applied his decisions to actual cases as the final word of the Law. In addition to his knowledge of the Talmudic law he was versed in the Cabala, which he used in explaining various passages of the Bible. His mastery of Hebrew is evidenced by the seliḥot which he composed in commemoration of the Chmielnicki tragedies. As a logician he stood, perhaps, first among the Talmudic scholars of his age. Shabbethai wrote the following works: "Sifte Kohen" (referred to above); "Seliḥot" for the 20th of Siwan, in memory of those killed during the tragedy of 1648 (Amsterdam, 1651); "Sifte Kohen," on Shulḥan 'Aruk. Ḥoshen Mishpaṭ (Amsterdam, 1667); "Ha-Aruk," a commentary on the Yoreh De'ah (Berlin, 1667); "Neḳuddot ha-Kesef." criticism of the "Ṭure Zahab" of R. David ha-Levi of Lemberg (Frankfort-on-the-Oder, 1677); "Teḳafo Kohen," general laws concerning "teku," etc. (Frankfort-on-the-Oder, 1677); "Geburat Anashim," on section 154 of the Shulḥan 'Aruk, Eben ha-'Ezer (Dessau, 1697); " Po'el Ẓedeḳ," an arrangement of the 613 commandments of Maimonides (Jessnitz, 1720); a discourse upon the passage "Kammah Ma'alot"in the Haggadah (Presburg, 1840; abbreviation of "Kerem Shelomoh"). Fuenn, Ḳiryah Ne'emanah, p. 77, Wilna, 1860.